Traders spend a great deal of time thinking about the markets they trade. This is natural since their success is dependent on an understanding of their market. It is also natural since trading tends to be a fairly rapid process. The physical action of buying and selling requires just a few seconds at a time. But, to be done well a trader needs to understand how a market will react to their orders if they are a large trader. For small traders, an understanding of the nature of the trend could be useful. After thousands if not millions of traders have spent time studying the stock market, much is known. And many important pieces of information are distilled into short sentences that mean a great deal to successful investors. A Market of Stocks or a Stock Market? One of the most useful concepts for traders to understand is the idea of whether we are experiencing a “stock market or a market of stocks.” This is a common term among traders and is a succinct summary of the difficulty of trading. In this phrase, a stock market indicates a time when the market is moving strongly in one direction and almost all stocks are participating in that trend. A market of stocks would be a time when many individual stocks are moving with the averages and many are moving in the opposite direction. Understanding that distinction can be profitable. In a stock market, traders simply need to buy or establish a short position in the most volatile broad market average. In a market of stocks, selectivity will be the key to success. Over time, it’s been possible to determine some general guidelines for the best time to trade a market of stocks. It seems as if the market behaves this way during a bear market. In a bull market, the majority of stocks are moving up. There are variants of that quote and Buffett might be like the New York Yankees catcher Yogi Berra who said, “I never said most of the things I said.” But assuming Buffett made the comment about swimming naked, what he meant is that many managers confuse brains with a bull market. In a bull market, almost all stocks are rising, and it is difficult to determine which managers are the best. The ones with the best relative performance may simply be the ones taking the most risk. When the tide goes out, in other words when the market falls, Buffett notes that we will see who is swimming naked. This is simply because the bear market turns into a market of stocks. The best managers will deliver returns or at least lose less than the market averages. When the dominant trend is down, it may not be possible to deliver a gain, but preserving capital would be a sign of good management. 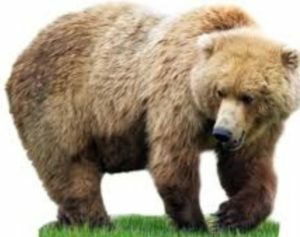 Knowing that bear markets will be different than bull markets, we can study the recent bear markets to determine how stock selection could be important. Since 2000, there have been two bear markets. From March 2000 to October 2002, the S&P 500 index fell more than 42%. Then, from October 2007 to March 2009, the index fell more than 54%. We can learn from studying the sector level returns during those bear markets. Sectors are the broadest grouping of stocks within an index. The stocks are grouped by their main business line and include different industries and subindustries. For example, the consumer discretionary sector includes the food and staples retailing industry which includes the drug retail, food retail and food distributors subindustries. Each sector contains several industries and each industry contains several subindustries. 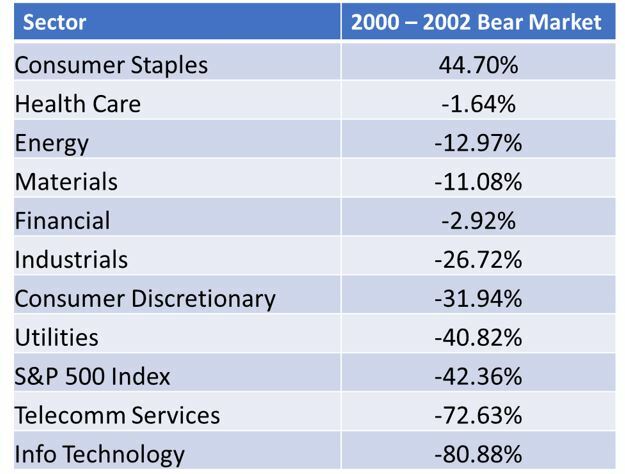 To begin this analysis, the table below shows performance by sector during the bear market that began in 2000. Consumer staples were big winners over that time. Information technology was the worst performing group. A number of sectors outperformed the S&P 500- index. We can draw a number of important lessons from this. First is the idea that a bear market is a market of stocks. The majority of sectors beat the market which indicates that many individual stocks beat the market. That demonstrates the need for selectivity in a bear market. Second, the bull market which preceded this bear market was characterized by a bubble in internet stocks. These companies fit into the information technology sector, the worst performing sector in the bear market. We can expect market leaders near the end of the bull market to be among the worst performers in the bear market. Finally, consumer staples are items consumers must buy no matter what the stock market is doing and we should expect strong performance from this sector in bear markets. We can test these ideas using data from the bear market that began in 2007. If the hypotheses listed above are correct, we should see the consumer staples near the top in performance, we should see the index near the bottom in performance based on the theory that a bear market is a market of stocks. As to what to look for near the bottom of the list, we need to recall that the bull market that ended in 2007 was characterized by a bubble in housing. This affected the home builders which are a part of the consumer discretionary sector and financial stocks which lent to the builders. 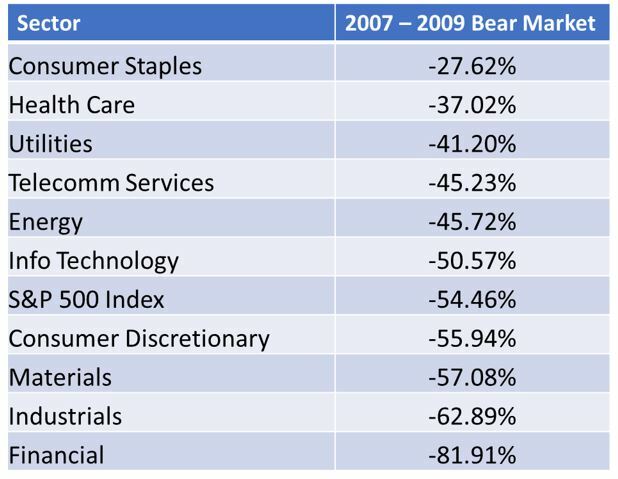 The table below summarizes the bear market performance of sectors. Once again, consumer staples top the list. Six sectors beat the index and four lagged the index performance indicating many stocks fared better than average and confirming that a bear market is a market of stocks. The consumer discretionary sector, weighed down by home builders, and financials which lent to the home building industry, underperformed the index in the bear market. This confirmed that the market leaders at the end of the bull market will maintain a leadership position on the way down. Looking ahead, this data tells us that now, as the bull market ages, could be a good time to invest in consumer staples stocks. The sector includes retailers as noted above in addition to food and tobacco stocks and household and personal care product makers. These could be among the best performers, or at least the smallest losers, in the next bear market according to history.